Such schemes include misclassifying employees as independent workers to pay them lower wages and deny them benefits such as health insurance, unemployment, and workers compensation. 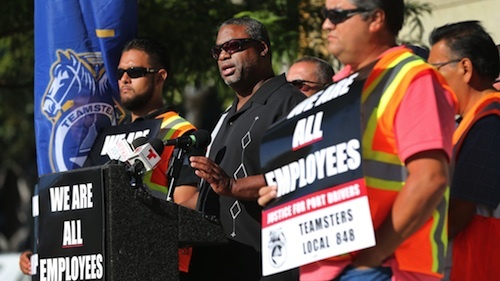 Monday’s strike will include drivers from several different trucking companies and is backed by Teamsters union Local 848 and Los Angeles City Councilman Joe Buscaino. “The truck drivers are asking to be recognized as employees instead of independent contractors so that they can get the wages they rightly worked for and workplace protections,” said Teamsters spokesman Nick Weiner. He is also director of the Justice for Port Drivers Campaign. 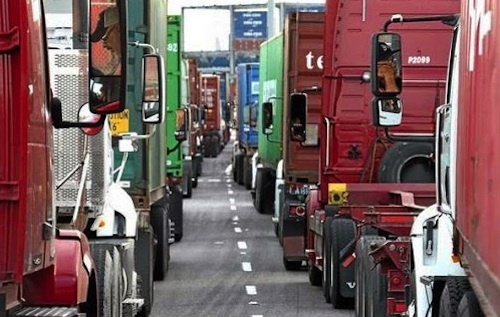 In addition to strike action, port truck drivers have also taken legal action over the last several years. Since 2010, over 1000 civil cases have been filed with the California Labor Commission and drivers have won in over 97% of the cases heard. Judges have consistently issued rulings with a clear message that companies can’t legally classify port truck drivers as independent contractors when their jobs fit the criteria of company employees. As employees, they must be paid at least minimum wage for the hours worked, they are entitled to receive benefits and they also can’t be charged for trucks and equipment used to do work for the company. And according to the findings of an extensive yearlong investigation conducted by USA TODAY, the alleged mistreatment of drivers does not end there. The investigation spoke to more than 300 drivers and accessed sealed testimony in several labor dispute cases to uncover worse claims of abuse such as companies physically preventing drivers from leaving work, forcing them to work against their will for up to 20 hours/day and not paying them anything unless they agreed to falsify logs. The investigative team wanted to know how employers were able to exert so much control and found in many cases drivers were locked into truck leases, initially thinking they were paying to own their truck like a mortgage. Instead, their employer used it as leverage holding it over their head by threatening to take away their trucks and keep their money if the driver quit or did something to get fired from the job. One driver, Eddy Gonzalez, said after he took seven days off work to care for his dying mother, he returned to work only to find out the company had fired him and took the truck he had paid thousands of dollars towards. Ho Lee told a similar story where he had spent over two years making $1,600 monthly payments towards his truck and the company fired him, took the truck and everything he paid into it after he fell sick and missed a week of work. 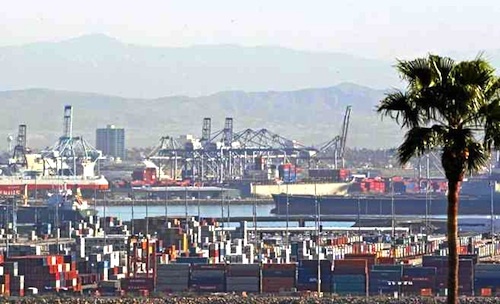 The latest strike comes just days after Los Angeles Mayor Eric Garcetti and Long Beach Mayor Robert Garcia announced their goal of requiring zero emission trucks at the ports by 2035. Eric Tate, secretary-treasurer of Teamsters Local 848, says that while they certainly support clean air, there is serious concern about how the Clean Air Action Plan will impact the drivers and who will ultimately end up paying for it. “The last time they did this in 2008 with the Clean Truck Program, the corporations ended up passing on the cost to the workers by requiring them to lease a truck in order to get hired and illegally misclassifying them as `independent contractors,' leaving very little for the workers to take home to their families. We don't want that to happen again," Tate said.